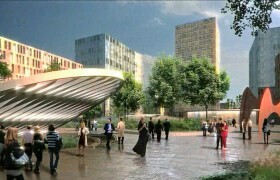 When the St. Louis Development Corporation published their request for proposals for transit-oriented development consulting services, they included in the document a desire to study the possibility of relocating the Central West End MetroLink station from Euclid to Kingshighway. What the SLDC did not include was any reasons why it was considering moving the Central West End station. Nor did it mention that ideas to relocate or redesign the Central West End stop have been floated repeatedly since well before MetroLink opened for service. Drawing of MetroLink station entrance at Kingshighway. // MetroLink DEIS. Plans from the 1984 draft environment impact study for what would become MetroLink did not originally call for a Central West End station at Euclid. Rather, they show drawings of the station located just east of Kingshighway underneath the garage for Childrens’ Hospital. The primary station entrance would have taken people from street level at Kingshighway to the eastbound platform below (at the time, MetroLink stations were being planned with 4” high platforms with mid-station(!) crossings to reach the far-side platform). The station would have also been accessible from Euclid, but only after a long walk not to dissimilar to the walk from Taylor to the existing station. By the time the final EIS report was published in 1987, the proposed location for the Central West End station had moved to its present day spot at Euclid. No explanation is given in the FEIS as to why the station was moved. MetroLink opened for service on July 31, 1993 and was an immediate success. Since then, the Central West End station and its surroundings have grown to become the powerhouse of the system. The Central West End station is the busiest in the MetroLink system with almost 6000 boardings per weekday during the summer. It is 50% busier than the Forest Park-DeBaliviere station, the second busiest in the system. The station’s existing location not only efficiently serves the vast majority of BJC’s medical campus, but it’s place on Euclid allows it to serve the southern reaches of the Central West End neighborhood to the north. BJC Health System wants the Central West End MetroLink station on Euclid Avenue relocated to Kingshighway as part of its $225 million redevelopment project at Barnes-Jewish Hospital. BJC has asked its architect, Hellmuth, Obata & Kassabaum Inc., to look at the feasibility of relocating the station as it develops the master plan for renovation and development at Barnes-Jewish. If the project gets on track, BJC will pick up the tab. It’s interesting to look back and see BJC complaining about the level of congestion on Euclid and within the medical campus then caused by an overflow of cars and buses competing for space with pedestrians. Many years later, BJC would begin the process of closing off streets that has recently turned Euclid into a kind of urban oasis. // BJC Request for Inspiration video. It’s also interesting to see how BJC perceived it’s campus, that Euclid was its backdoor and Kingshighway its front door. At the time, the congestion and dreary landscape along Euclid certainly offered little respite whereas Kingshighway, with Forest Park nearby, could offer a glimmer of calm and serenity, that is if you could get away from the din of traffic. But what is truly fascinating within the excerpt above—the line regarding BJC’s perceived front and back doors—is that it would be repeated… almost 15 years later. Last month, BJC released a video showcasing the work of a trio of urban design firms and collaborators. The video presented a vision for inspiration for how BJC and CORTEX could and should expand and fill in to become a true hub for health sciences and technology. Perhaps the most impressive presentation is the second clip performed by SOM. Aside from providing a fantastic overview of their work through flyovers and stills of the future BJC campus and CORTEX area, an excellent narration helps provide detail on some of the thoughts they put into the planning process. Though perhaps without knowing it, SOM repeated an idea first voiced by BJC 15 years ago. The idea is interesting because it seems to perfectly capture how BJC and the general public view and have viewed the medical campus, that it’s public face fronts Kingshighway and looks upon Forest Park. We imagine Kingshighway as a front door to the medical center. But the opinion that Kinghighway is the front door to the BJC medical campus is grounded on a fallacious perspective. BJC’s campus spans over 1500 feet along Kinghighway. In that span, there is only a single door designed as a main entrance to the buildings. That door, which leads to the Emergency and Trauma Center, is tucked behind a small circular driveway and lacks a direct sidewalk connection. The assumption is that you will drive or be driven to the hospital. And that is the perspective BJC has taken with it’s campus: a driver’s perspective. The hospital’s skyscrapers look their best and most impressive when viewed from afar whether it’d be approaching the med campus from Kinghighway, down I-64 or from Steinberg Rink or the the athletic fields in Forest Park (the best view, and the preferred view of architecture firms everywhere, is from a helicopter flyover). Euclid is another matter entirely. Here on the “back” side of the med campus where the Central West End MetroLink station currently resides, BJC has carried out a marvelous transformation. Whereas Euclid and its side streets were once dark and bleak congested with the conflicting movements of cars, buses, and pedestrians, today the streets are a kind of urban oasis. This oasis was the product of a collaboration between MVVA and Maya Lin and built at the same time as the new BJC Institute of Health, a building which replaced a parking garage and sits atop the MetroLink tracks. The transformation of the space occupied by the new BJC Plaza is no doubt relished by the thousands of MetroLink riders who walk through the space everyday. Since day one, the station has been extremely well used owing to its proximity to the vast majority of the buildings in the medical campus. 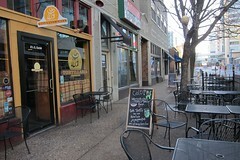 It is also well used by residents and patrons of the Central West End. Tom’s Bar and Grill, Wildflower, and Brasserie are just some of the great restaurants located about a quarter-mile from the MetroLink stop. But these restaurants, and the commercial heart of the Central West End, would be much farther away from a high quality line of public transit were the MetroLink station to move to Kingshighway. So would many medical buildings. Whereas a station located on Kingshighway would still efficiently serve the main part of the medical campus, many of the buildings east of Euclid would require significantly longer walks to reach. Bus riders transferring at the transit center on Taylor would see their walks increase to longer than a quarter-mile (the transit center would be forced to move.) And while having such easy access to Forest Park could be seen as a boon for transit riders, the lack of large attractors on the east side of the park does not make up for the loss of access to hundreds of jobs. Quarter mile walk shed for proposed MetroLink station at Kingshighway and existing one at Euclid. In many ways, it seems that the driving force for moving the Central West End station is entirely aesthetic. For example, in 2010, Washington University hosted a design competition to improve the station’s aesthetics and ambiance in conjunction with “renovations” of the adjacent power plant building—a building that incidentally seems to be the source of much consternation. [Paul Duell], the senior project manager for design and construction for the medical school, had a lingering, unsolved problem. The city’s Central West End Metrolink station, its most active metro stop, lay at his footstep — an ugly site in need of improvement. 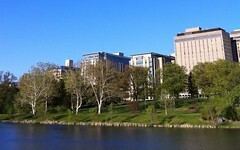 Although the St. Louis light-rail system has been highly successful, this active stop, which serves both the medical school and the Barnes-Jewish Hospital to form one of the largest nonprofit health-care complexes in the country, greets its approximately 5,000 riders with a daily dose of the medical school’s power plant. 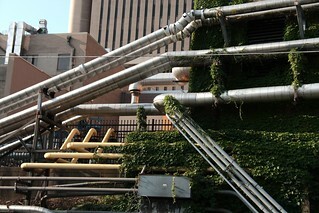 Imagine leaving work from patient care, exhausted, and looking up at a slew of pipes carrying steam or waste. When you look up descriptions of the Central West End station from transit foamers on the internet, “industrial” is one of the words most often used to describe its locale. The pipes and steam and dingy look of some of the buildings near the station hide the fact the area is one of the most walkable neighborhoods in the entire metro area. Even then, aesthetics are an insufficient reason to relocate the station. Nor should a driver’s perspective of the BJC campus be the primary shaper of the way hospital infrastructure is built and located. A MetroLink station at Kingshighway would likely serve fewer jobs, fewer residents, and fewer stores, restaurants, and businesses than the existing station at Euclid. Forest Park would be a beneficiary of a relocated stop, but only at the expense of the Central West End neighborhood. BJC must also recognize that thanks to all the improvements they’ve made along Euclid, that their “back yard” has become their “front yard”. In almost every way, the environment of the BJC campus is better on Euclid than it is on Kingshighway. No new building along Kingshighway is going to change that. And anyways, if the station were relocated to Kingshighway, how would the monorail ever reach it? In fairness, many of the improvements along Euclid have been due to the efforts of the Washington University School of Medicine. While WUSM and BJC try to work together on campus planning they are separate corporate entities sometimes with less than complimentary motivations and intentions. 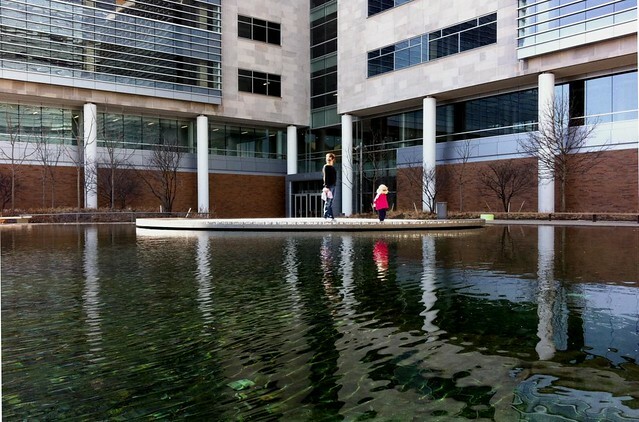 Make no mistake, the BJC Institute of Health building with its Maya Lin fountain and Michael Van Valkenburgh Associates landscaping would not have happened as it did without the planning and efforts of the WUSM. And despite the naming rights, the BJC Institute building is the property of Washington University. With the exception of the St. Louis College of Pharmacy, WUSM owns practically all of the property along Euclid between FFP and Barnes-Jewish Hospital Plaza. Perhaps BJC is jealous of how the plaza turned out and thinks by moving the CWE metrolink station it can have streetscape vibrancy at its front door. Unfortunately, the existing Kingshighway frontage and location isn’t conducive to the success of that. More realistically, I think both WUSM and BJC realize the CWE station will need some repairs and expansion in the near future. The CWE platform and infrastructure is aging more rapidly than the rest of the original 1993 stations, in my opinion. I’m pretty sure it was not designed for the number of riders it actually accommodates. It has been one of the great successes and assets of the Metrolink development. If the medical school had a design completion on how to “beautify” the view from the CWE platform (though I, as a regular rider from that station since 1993, truly love the industrialness of the setting) it’s clear the medical school expects to work with the station at that site, not relocate it. I would venture it’s more of one hand saying “what if” and the other hand not really caring for the moment. When it gets down to it, it will be quickly clear that moving the station west along the tracks to where it passes underneath Kingshighway (placing the station underneath the WUSM’s Northwest Tower and SLCH Parking Garage) is not really going to happen. It’s more likely to expand a bit further east, closer to Taylor Avenue if anything. But, as always in this town, you never know what people are thinking. It’s good to keep an eye on it.